Will pulled me in on a painting job in West Seattle, nothing too fancy, just a couple of weeks. I like short, self-contained projects. And the commute is nice, too. I put my bike on the 10:25 a.m. #5 bus just in front of our place on Fremont Avenue. It turns into the 54, I get off at the junction after 40 minutes of reading Celine (about the right dose of his dense prose), then it's a hair-raising, skull-rattling downhill run on cracked and bumpy streets to the waterfront. 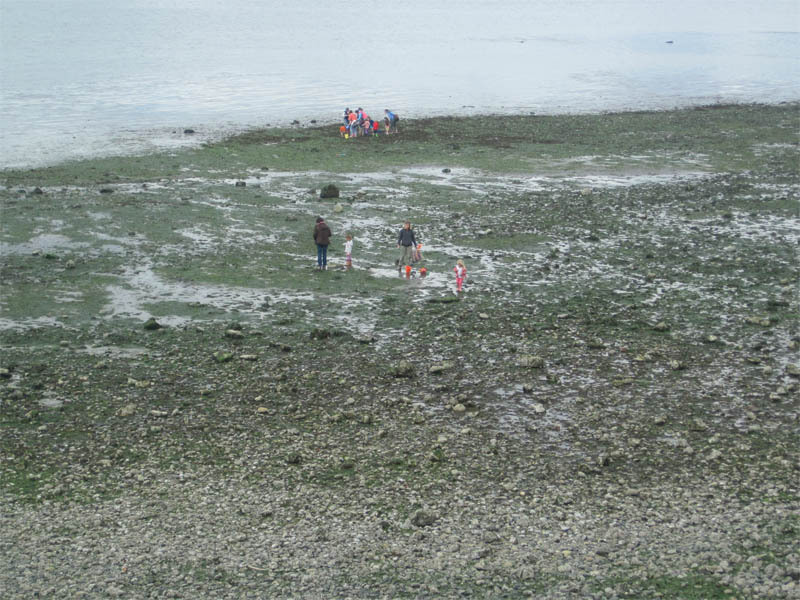 The tide was way out, the greens of exposed flat punctuated by colorful specks of school field trippers. The salt air is so invigorating I slow down to breathe all I can, that same mix of energized and relaxed I felt in Hawaii. It's all about the ocean, I guess. It's positively Victorian at the edge--the hem of a dress demurely pulled back just a touch to reveal an ankle and the people come running for a tantalizing look.